Does anyone know if chicken “tenders” are the same as chicken “nuggets?” I lump them all together (pun intended). I would have inspected the contents of the tenders I purchased, but I ate so fast that I wouldn’t have had time. One of the “bonuses” of eating school lunch is that I can eat so quickly it gives me time to tackle a couple brief administrative tasks like emails, filing, etc. I have taken to eating only the top layer of jello, which is where all the fruit is. It’s very sweet stuff. And the carrots were fine. He probably also has a PhD in Wii. Just sayin. 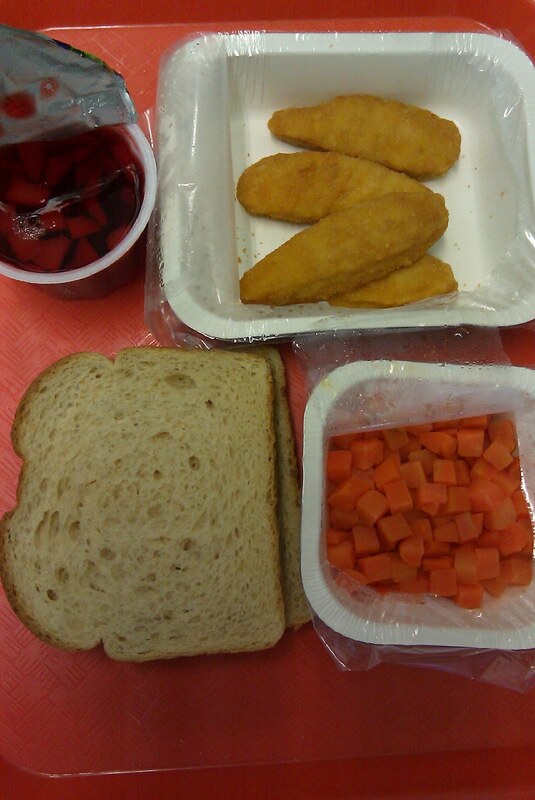 But in make-believe-false-advertising-land of school lunches these terms have the Wikipedia definition: Chicken fingers (also called "chicken strips", "chicken toes", "chicken fillets", or "chicken tenders") is chicken meat that does not include any bones or skin. ^Though, more specifically, the tenders are a particular part of the chicken breast called the tenderloin which has a single tendon running through it. So, technically should they be different? Yes. At your school does there appear to be a difference? Not from what I've seen. Chicken tenders are, notionally at least, tenderloin which is a whole cut of meat (you can buy them in the supermarket and see for yourself). Nuggets are a pulp of all the discarded trimmings and bone ("meat sweepings" as an old acquaintance called them). The first episode of Jamie Oliver's Food Revolution showed him making homemade 'chicken nuggets' for a gang of kids by essentially throwing a chicken carcass removed of all its edible meat into a blender in front of their eyes, then frying it in a pan. They all volunteered to eat it. I have not been able to even look at a nugget since watching Jamie Oliver's "how to" on them. Gross, gross, gross! I mean, I knew what they were… but actually seeing it done really put it in perspective for me. I agree w/previous posters. A tender is a cut of meat from the chicken breast. You could theoretically make a nugget from a small chunk of whole breast meat but they usually are ground & pressed. Chicken tenders are SUPPOSED to be chicken breast tenderloins, but those that you are eating are defiantly processed and shaped to resemble chicken tenders. They should be called chicken "tenders"! The carrot cubes are weird to me. It seems like so much trouble to make them into those little cubes at the processing plant. Plus, they remind me of Veg-all, which is so disgusting to me. 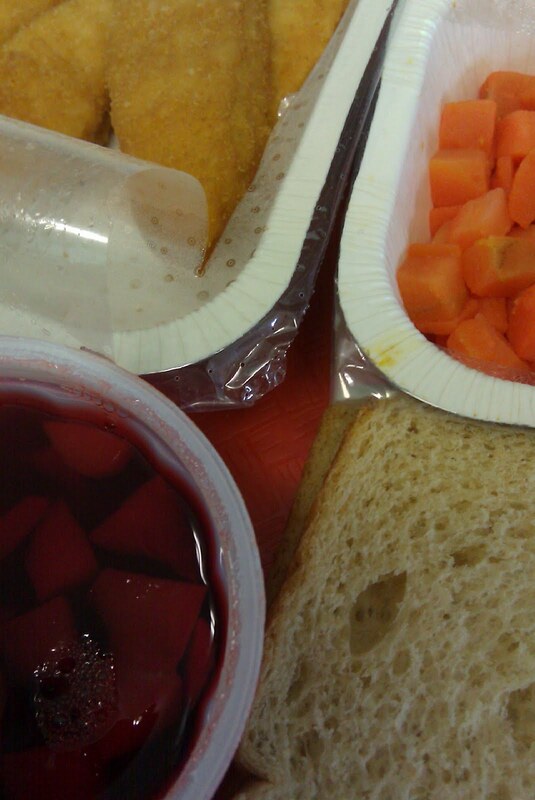 Totally love your blog and I have started tweeting your lunches! I was slicing chicken breasts into long strips to make "tenders" for my kids, but then on second thought I decided I'd rather they cook faster so I cut them into pieces for "nuggets". Haha that is so funny! I work in a school as a paraeducator and I hear kids say the craziest things, they're too funny. Since I started reading your blog, I've paid way more attention at lunch. At this point, I don't know what to do… those poor kids. Their food looks terrible. Is water ever offered? Unless i am mistaken this is something that seems to be missing. Don't you think water should also be offered as a beverage? I know my two came home everyday from school complaining of headaches, we finally narrrowed it down to lack of hydration. When they made a point of drinking more water throughout the day the headaches lessened.FYI I woulf definitely rather drink bottled water than have to only drink out of a fountain yuk? I am feeling more and more sorry for you Mrs. Q. Today I had lunch with my 3rd grader. I had a southwest chicken salad, fresh (yes fresh, not canned) fruit with yogurt and bannana bread. My daughter had a grilled cheese sandwich (in plastic, but still tasted grilled), fresh fruit, baked chips with salsa and milk. I noticed many children had chosen the salad option. There was also a "mega box" option that contained a croissant sandwich, a cut up orange, raw broccoli, baked chips and a yogurt and a chicken caesar salad option with dressing on the side. At the end of the line there was a bowl of apples, oranges and bananas (I saw some children pick up this stuff too). The downside was that there were popsicles, low fat ice cream and cookies also for sale. The lunch ladies supposedly only allow children to chose one and only if they have enough money in thier lunch account. Also, children on reduced lunches are not allowed to purchase "a la carte," they must purchase the full lunch that includes veggies and fruit. It appears as if the quality of lunch depends on your school district and probably the percentage of kids on free or reduced lunch programs. I recently found out that about 20% of our elementary is on reduced lunch. If you lose your job, you can always move to our school district! You are doing a great job, awareness is the first step to change. I think these chicken tenders aren't real meat, but I'm going to pay closer attention next time!